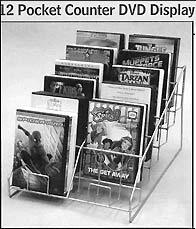 5 + Floor or Counter spinner racks on this page, ordered at same time, shipped to same address, qualify for quantity discount. 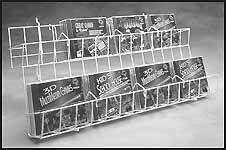 (May be combined) 8+ Wall mount racks or small displays for Gridwall, Slatwall and small countertop stands ordered at same time, shipped to same address, qualify for quantity discount. White Powder Coated finish SHIPPING NOTE: This rack ships in a carton categorized as "Oversize-3" by FedEx - 78 Lbs. Dimensional weight. White or Black Powder Coated finish SHIPPING NOTE: 32-CDF ships in carton categorized as "Oversize" by FedEx - 42 Lbs. Dimensional weight. 48-CDF ships in carton categorized as "Oversize-2 " by FedEx - 57 Lbs. Dimensional weight. Rack pictured at left is representative of 48-CDF rack. More Pockets = Larger Diameter. Rack pictured at left is representative of all racks in the CDC group. Special sizes for DVD and CD - 2 Widths to Choose From - 5.5"* or 6"
Pockets accommodate products 3" - 8" high. Perfect for small countertop areas and point of purchase display. Six Pocket Stand 5.5" Wide * 12"High x 12"Deep x 6"Wide 6-SHS-100 * 2/$80.00 - Addl: $40.00 Ea. Six Pocket Stand 6" Wide 12"High x 12"Deep x 6.5"Wide 6-CHS-100 2/$80.00 - Addl: $40.00 Ea. 8 + of these displays, ordered at same time, shipped to same address, qualify for quantity discount. Pockets accommodate products 5" - 10" high and up to 5.75" Wide. Size: 10" H x 12.5" W x 18.5" D.
1 2 Pocket Stand for CD/DVD 10"High x 18.5"Deep x 12.5"Wide S-19-012 2/$58.00 - Addl: $29.00 Ea. Pockets accommodate products 4" - 8" high. Can be mounted on wall or used with slatwall/gridwall hooks - 2 "eyes" built in for mounting . Double Pocket Stand 5.5" Wide * 7"High x 7"Deep x 5.5"Wide 5575-SS-250 * 4/$68.00 - Addl: $17.00 Ea. Double Pocket Stand 6.6" Wide 7"High x 7"Deep x 6.5"Wide 6040-SS-250 4/$68.00 - Addl: $17.00 Ea. Pockets accommodate products 7" - 10" high. 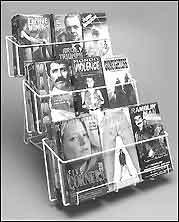 2 Pocket Stand for DVD, 6.5" Wide 12.5"High x 9"Deep x 6.5"Wide 6090-LS-250 4/$72.00 - Addl: $18.00 Ea. White Powder Coated finish SHIPPING NOTE: This rack ships in carton categorized as "Oversize" by FedEx - 37 Lbs. dimensional weight. White or Black Powder Coated finish SHIPPING NOTE: This rack ships in carton categorized as "Oversize-3" by FedEx - 78 Lbs. dimensional weight. ORDERING: All orders require a shipping quote. Please use our web Order Form for requesting shipping quotes and sending order information. PAYMENT can be made by Credit Card (Visa, Mastercard, Discover or AMEX), Check, Money Order, PayPal or Bank wire transfer. All credit card payments must be made through our secure web server - no phone, faxed or e-mail credit card payments are processed. PayPal users may make payment with their PayPal accounts. Click on the PayPal icon above and it will take you to their site where you can register and establish a free account. When submitting payment to us for your order through PayPal you must list the recipient e-mail account as: Payments@ArgonautDisplays.com . ALL RETURNS must have prior authorization from us. Orders canceled after shipment, refused deliveries and returns may be subject to 25% restocking fee unless other arrangements have been made. All merchandise must be in the ORIGINAL packaging and in resalable condition. Customer is responsible for ALL shipping charges on returned items unless other arrangements have been made. Claims for damage sustained in shipping must be made immediately and recipient must keep damaged goods and all packaging materials for carrier's inspection until claim is settled.